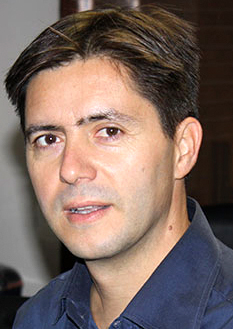 Santiago Sanchis Mullor studied Sciences of Information (Journalism). He has worked for the press, radio and television, and nowadays directs his own company of communication services, and also the regional newspaper El Periòdic d’Ontinyent. He is the author of several plays in Valencian (Alerta, aleeerta, Univers XXXL, Festeropaties), and her debut as a novelist was Memoria del traidor, a work that after being released by Slovento in 2010, was re-edited by Ediciones Babylon. He is also the author of El hijo de Yuri Gagarin (digital edition published by Ediciones Babylon).